Greenleaf Book Group, 9781608322510, 160pp. Most people have spent their lives randomly bouncing around like bumper cars, never arriving at the life they want. If fact, new research shows that only 15 percent of adults have a plan for their life. But what if there was a way, a proven way, to experience more of what life has to offer? To help readers get from where they are today to where they want to go, Horwath illustrates his five-step plan with examples of people who have successfully used strategy as a bridge to realize their destinies. 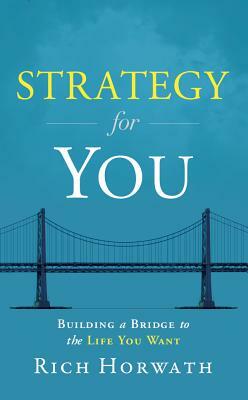 "Strategy for You" gives readers the opportunity to maximize their true potential at work and at home and build that bridge to the life they've always wanted. Rich Horwath is a business strategist, author, and speaker committed to helping people think strategically to grow profitably. He is a former chief strategy officer and professor of management and is the founder of the Strategic Thinking Institute. His strategy consulting, training, and speaking work with world-class organizations has been profiled in Investor s Business Daily and on NBC and FOX. Horwath s previous book, "Deep Dive," has been described by the director of worldwide operations for McDonald s as the most valuable book ever written on strategic thinking. He lives in Barrington Hills, Illinois, with his wife and two children. For more information visit www.strategyskills.com."